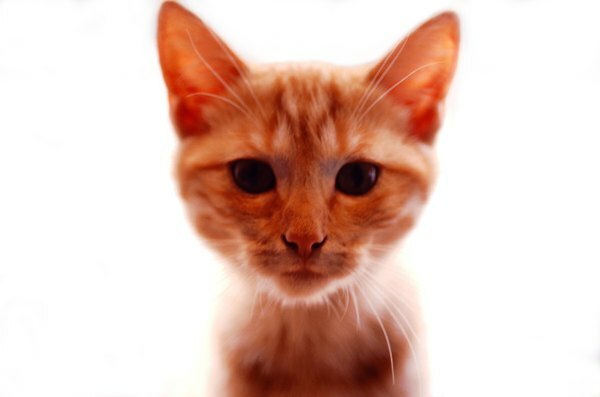 Like all tabbies, ginger tabbies have an 'M' on their foreheads. Ginger tabbies, also called red or orange tabbies, are white striped with any shade of orange or red. Tabby patterns include classic swirls, mackerel, ticked and spotted, but all have the typical “M” on the forehead. The wild ancestors of today’s domestic cats probably sported the tabby pattern – it provides good camouflage for sneaking up on prey or unsuspecting creatures that venture into your yard – and the tabby pattern is often seen in ancient depictions of cats. That attractive ginger color is a naturally occurring mutation. If you think your orange baby is easy-going, you’re not alone. In the early 20th century, George Ware, the owner of a cat boarding center, formed his own theory of color and temperament and described ginger tabbies as “big softies and laid back to the point of laziness. Like being stroked, but dislike being picked up and cuddled.” A 1973 book published by Pedigree Foods described ginger tabbies as “quiet, docile and affectionate.” In a recent study at the University of California, cat owners were asked to attribute personality traits to their cats. Orange cats were most often characterized as friendly. Another stereotype is media-driven – Garfield is irascible, and Morris is aloof and finicky. These traits actually might have a basis in fact. The gene for ginger is linked to gender, and about three out of four ginger cats are males. Any intact male will exhibit certain behaviors, including roaming and less interest in hunting. However, rest assured that if your ginger tabby is loved and socialized, he will in turn be a loving, affectionate kitty. In some species, a link between color and personality has been established. White rats and mice are generally more docile than their gray cousins. Russian biologist D.K. Belayev bred foxes for tameness without regard for color, but over generations the tamer foxes also became similar in color, hinting at a link between the traits. Cats have much more color variation than rodents and foxes, but it’s possible that common stereotypes in cats have a genetic basis, too. How much of this is perception and how much genetics is hard to determine, but certain breeds of cat do have personality traits that are linked to the breed. For example, Siamese cats are social, curious and talk a lot. These traits also turn up in other colorpoint breeds, so these traits are probably linked to color -- maybe the genes sit near each other on DNA strands. Whatever traits your ginger tabby might share with other orange kitties, he will likely share more with cats in general. Like humans, each cat is an individual -– as all cat owners can attest to. Messy Beast: IsCoat Colour Linked to Temperament?